The “Fast Track” methodology is easy to follow step-by-step. You can adopt the technique fast and easy to your own game. Just remember to practise your new swing in front of a mirror, without a ball, before you enter the court. We use the semi-western grip. An effective grip for putting topspin on the ball. You´ll learn how to play a modern forehand with a high and explosive bounce, (the heavy topspin), pushing your opponent behind the baseline. You will also learn how to use your body the most effective way. How to put power in to the game, how to hit hard – in a way thats gentle to your body. See an 8-year old hit like a pro! The “Fast Track” methodology works for players on all levels: kids, amateurs, beginners and advanced players right up to pro level. In this movie you´ll see how Linneá 8-years old adopts the forehand methodology. The last sequence shows a forehand comparison between Linnéa and WTA-Tour player Justine Henin. See an 11-year old hit like a pro! The “Fast Track” methodology works for players on all levels: kids, amateurs, beginners and advanced players right up to pro level. In this movie you´ll see how Josefine 11-years old adopts the forehand methodology. 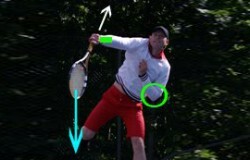 The last sequence shows a forehand comparison between Josefine and ATP-Tour player Andy Murray. “Tip-Toe”) or the feet stand still and jump straight up. It´s all individual what we like and the pro´s use both techniques.